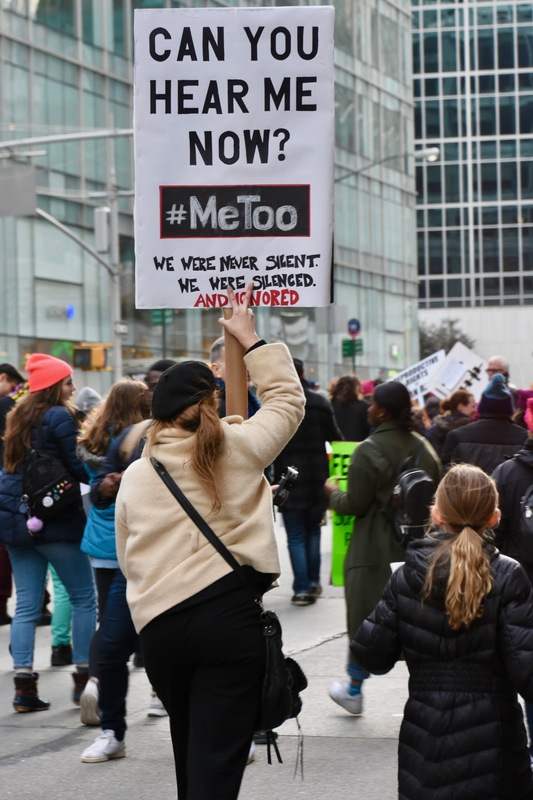 During conversations about #MeToo, I find myself thinking often about time, perhaps most directly because the call of #MeToo was answered in 2018 by #TimesUp. This subsequent movement had its own share of problems, from questions about individual actors to pertinent criticism of Hollywood’s celebrity machine. But from where I stand at the very fringes of pop culture, it’s heartening to watch the cyclical, “That’s just how power works” morph into a full stop: “No more.” Not all the evidence offered up to public scrutiny has received full credence, unfortunately; but every conversation about power dynamics and gender violence shows that we are at a rare moment when discussions about how rhetoric constitutes truth-as-bias have spilled over from their usually restricted purview in humanities classrooms. Suddenly, newspaper Op-Eds are debating philosophical abstractions about the malleability of reality—believing her and believing him as if we’re all within a literary house of mirrors. The keyword I have chosen is Boundaries. I am interested in boundaries as they relate in particular to the middle portion of “A Game of Chess,” which begins “My nerves are bad tonight.” This section not only features annotations by Ezra Pound, but also it bears the mark of Eliot’s first wife, Vivien. It demonstrates one of the most important and most difficult elements of #MeToo: the messiness of boundaries emotional, intellectual, physical, and, in this case, textual. Some stories are told and retold: they seem to strike a profound chord and to resonate in new ways. The story of Philomela, for example, reappears in Shakespeare’s Cymbeline when Imogen has fallen asleep while reading Ovid’s tale. Imogen’s bedroom is described—by a creepy Iachimo as he watches her—with details similar to those in “A Game of Chess.” Lavinia, in Titus Andronicus, is also raped and her tongue cut out. Titus compares her to Philomela, but the assault is even worse: her hands are cut off so that, unlike Philomela, she can not even weave a tapestry of her story. Today the story reappears in commentary and art: The Colby College website account claims it “provides a powerful warning to those who would silence their victims” because, as it does in Ovid, “the truth will out!” Paisley Rekdal retells it to expose the demand for a story. In the Margate exhibition recalling Eliot’s recuperation there, it appears as a graphic image of sorrow. For the #MeToo generation, the story of Philomela, a recurrent allusion in “The Waste Land,” provides an intense articulation of our own experiences. If ambiguity is the bread and butter of academia, discomfort is probably its toaster, by which I mean that our profession loves and relies on discomfort. In the classroom, and even in reading, we take this discomfort to be productive, even therapeutic; we see it as an invitation to find in the text a space that will alleviate the feeling, or to make that space in the discourse that surrounds it. Transforming discomfort into opportunity—even producing discomfort for said purpose—is a trope so common in teaching narratives that it sometimes feels like a generic marker. Yet as the stories of #MeToo multiply, I’m beginning to question the function and fungibility of that feeling. Those of us who study modernism have also been, perhaps, trained to linger on the hero’s journey of men. The contours of the field early on, indeed, were shaped by such hero’s journeys. Paul Saint-Amour, in the introduction to the special issue of Modernism/modernity on “weak theory,” casts these contours as explicitly masculinist, writing that we have “equated” modernism with “warrior masculinity” and that the “heroic ‘men of 1914’ script likely compounded baseline cultural and institutional prejudices in effacing” women writers and others. Recovery work has raised up silenced or unheard voices, even as the value placed on those voices and that work by the structures of prestige and power that define academia is sometimes measured in coffeespoons. Rai Peterson, in arguing that we should attend to how women modernists like Nancy Cunard and Hope Mirrlees speak back to T. S. Eliot, has pointed out that “[r]eaders . . . [still] believe that Eliot’s work speaks definitively for its age.” It matters who gets to speak and who does not, and for whom, and how we hear what they say. In engaging the topic of this roundtable, I’m coming from the perspective of someone who has devoted her career to undergraduate teaching, and who has thought a lot about feminist pedagogy and gender and sexuality in the classroom and in academe. In reading “The Waste Land” in the context of #MeToo, what space might students as well as emerging critics find for their own voices? Can they speak back to certain voices—and thus ways of reading—that dominate? Or are those voices—and ways of reading—silencing in their very volume? Fig. 1. Women’s March, New York City, 2018. Photograph by Alec Perkins. Image courtesy Wikimedia Commons. To encounter black modernity via W. E. B. Du Bois is to tangle with questions of exemplarity and exceptionality. For my students in a large lecture class on the “American Experience,” many of whom are the first in their family to receive a college degree, many of whom are first- or second-generation immigrants, Booker T. Washington’s message of casting one’s bucket down can resonate more strongly than what they sometimes read as the elitism of Du Bois’s talented tenth. As a member of that tenth, Du Bois does not always speak to them—yeah, well, that guy went to Harvard, but that’s not most people; that’s not me. The literary object is in flux. No longer are scholars so tightly bound to the poem, story, book, oeuvre, canon, or national literature. Yet from the undergraduate survey to the graduate seminar, most teaching stubbornly clings to these traditional objects.